Micro-processor programmed ensuring repeatable and fast changeovers. Stainless steel cabinet one piece welded construction. Water tight (Nema 4) control box. Independent adjustable trimming device of pumps to fine tune each piston pump. Dual speed controls giving separate adjustment capabilities for aspirating and discharging strokes depending upon products being filled. Master control adjustments, permitting volume changes of all pumps (1-4 pumps) with a simple calibrated hand adjustment assuring fast repeatable settings between changeovers. All viscous and highly accurate filling applications. Excellent with viscous products. 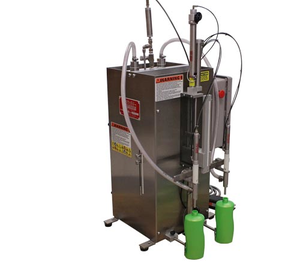 ideal for applications such as: reduced speeds, short production runs, limited space and trial runs and R & D where precision filling of a wide range of product is required. - Air: 2-3 cu/ft per min. 90psi.